Boeskorov, G. G. 2002. Taxonomic position of Alces latifrons postremus and relationships of the genera Cervalces and Alces (Alcinae, Artiodactyla, Mammalia). Paleontological Journal 36:660-667. Breda, M. and M. Marchetti. 2005. Systematical and biochronological review of Plio-Pleistocene Alceini (Cervidae; Mammalia) from Eurasia, Quaternary Sci. Rev. 24:775–805. Cap, H., S. Aulagnier, and P. Deleporte. 2002. The phylogeny and behaviour of Cervidae (Ruminantia, Pecora). Ethology, Ecology and Evolution 14:199-216. Cronin, M. A. 1991. Mitochondrial-DNA phylogeny of deer (Cervidae). Journal of Mammalogy 72:533-566. Di Stefano, G. and C. Petronio. 2002. Systematics and evolution of the Eurasian Plio-Pleistocene tribe Cervini (Artiodactyla, Mammalia), Geol. Romana. 36(2002):311–334. Douzery,E. and E. Randi. 1997. The mitochondrial control region of Cervidae: evolutionary patterns and phylogenetic content. Molecular Biology and Evolution 14:1154-1166. Duarte, J. M. B., S. González, and J. E. Maldonado. 2008. The surprising evolutionary history of South American deer. Molecular Phylogenetics and Evolution 49(1):17-22. Eisenberg, J. F. 1987. The evolutionary history of the Cervidae with special reference to the South American radiation. Pages 60-64 in Biology and Management of the Cervidae. C. M. Wemmer, ed. Smithsonian Institution Press, Washington, D.C.
Eisenberg, J. F. 2000. The contemporary Cervidae of Central and South America. Pages 189-202 in Antelopes, Deer, and Relatives. E. S. Vrba and G. B. Schaller, eds. Yale University Press, New Haven. Fontana,F. and M. Rubini. 1990. Chromosomal evolution in Cervidae. BioSystems 24:157-174. Gilbert, C., A. Ropiquet, and A. Hassanin. 2006. Mitochondrial and nuclear phylogenies of Cervidae (Mammalia, Ruminantia): Systematics, morphology, and biogeography. Molecular Phylogenetics and Evolution 40(1):101-117. Groves, C. P. and P. Grubb. 1987. Relationships of living deer. 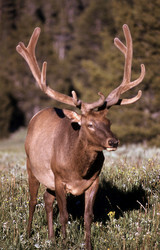 Pages 21–59 in Biology and Management of the Cervidae. C.M. Wemmer, ed. Smithsonian Institution Press, Washington and London. Grubb, P. 2000. Valid and invalid nomenclature of living and fossil deer, Cervidae. Acta Theriologica 45:289-307. Heintz, E. and F. Poplin. 1981. 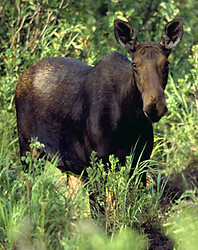 Alces carnutorum (Laugel, 1862) du Pléistocène de Saint-Prest (France). Systématique et evolution des Alcinés (Cervidae, Mammalia). Quartärpaläontologie 4:105–122. Kahlke, H. D. 1990. On the evolution, distribution and taxonomy of fossil Elk/Moose. Quartärpaläontologie 8:83–106. Meijaard, E. and C. P. Groves. 2004. Morphometrical relationships between South-east Asian deer (Cervidae, tribe Cervini): evolutionary and biogeographic implications. J. Zool. Lond. 263:179–196. Ohtaishi, N. and H. I. Sheng, eds. 1993. 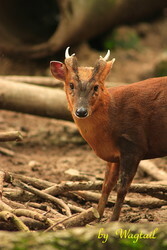 Deer of China. Elsevier Science Publishers B. V., Amsterdam. Randi, E., N. Mucci, M. Pierpaoli, and E. Douzery. 1998. New phylogenetic perspectives on the Cervidae (Artiodactyla) are provided by the mitochondrial cytochrome b gene. Proceedings of the Royal Society of London Series B 265:793-801. Scott, K. M. and C. M. Janis. 1987. Phylogenetic relationships of the Cervidae and the case for a superfamily "Cervoidea". Pages 3-20 in Biology and Management of the Cervidae. Smithsonian Institution Press, Washington. Vislobokova, I. 1980. The systematic position of a deer from Pavlodar and the origin of neocervinae. Paleontology J. 3:97–111. Vrba,E.S . and G. B. Schaller, eds. 2000. Antelopes, Deer, and Relatives. Yale University Press, New Haven. Webb, S. D. 2000. Evolutionary history of New World Cervidae. 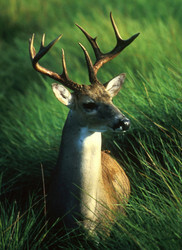 Pages 38-64 in Antelopes, Deer, and Relatives. E. S. Vrba and G. B. Schaller, eds. Yale University Press, New Haven. Whitehead, G. K. 1972. Deer of the World. Constable, London. Page: Tree of Life Cervidae. The TEXT of this page is licensed under the Creative Commons Attribution-NonCommercial License - Version 3.0. Note that images and other media featured on this page are each governed by their own license, and they may or may not be available for reuse. Click on an image or a media link to access the media data window, which provides the relevant licensing information. For the general terms and conditions of ToL material reuse and redistribution, please see the Tree of Life Copyright Policies.